OAKLAND, Calif. — She could tell by his fifth birthday. That’s when Nnamdi Asomugha’s mother, Lilian, says she knew her son was special. But she’s not talking about his status as one of the best defensive players in the NFL. Lilian is referring to her son’s work off the field. That mindset has stayed with Asomugha, 27, through his six seasons with the Oakland Raiders, and the one-year, $9.75 million contract extension he signed this past summer secured his status as one of the team’s veteran leaders. Since his breakout season in 2006, when he had eight interceptions, quarterbacks have mostly thrown away from him. And being on a losing team means Asomugha has worked as of the most underrated cornerbacks in the league — a lack of attention that’s fine by him. 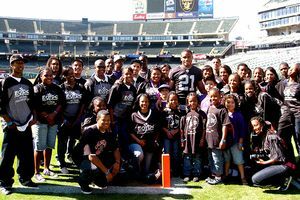 Because while the soft-spoken Asomugha loves football, he’s just as focused on his community efforts at the East Oakland Youth Development Center, at Narbonne High School in Los Angeles and across the ocean in his parents’ native Nigeria. Like his three siblings, Asomugha learned from the philanthropic example set by his mother, a pharmacist, and his late father, Godfrey, a petroleum engineer. Asomugha’s parents met in Nigeria, before moving to the U.S. for college and eventually raising children in Los Angeles. “Even when we were little, we were always helping, going to feed the homeless, community drives, that type of stuff,” Nnamdi says. Nnamdi and his older brother, Chijioke — they are 18 months apart — grew up playing Pop Warner football and idolizing Deion Sanders. When their father died of a heart attack when the brothers were 12 and 13, “sports were a great outlet for us,” says Chijioke, who played cornerback at Stanford. As a senior coming out of Narbonne High, Nnamdi was a highly recruited defensive back. He chose to play for Cal, where he continued his charity efforts. “My freshman year, I started working with a group called Touchdown for Kids,” Asomugha says. “However many tackles I got at safety, [the school would] donate a certain amount of money to help the underprivileged youth in Berkeley. We did it every year and I became the spokesman.” When Nnamdi became a Raider as the 31st overall pick in the 2003 draft, he continued the program in Oakland. During his senior year at Cal, Asomugha had a chance meeting with Regina Jackson, the president of the East Oakland Youth Development Center. The community-based nonprofit Center, which began in 1973 as a job training facility, has transformed under Jackson’s tutelage into an educational, academic and recreational haven for children ages 5 to 20. A major distinguishing factor is the Center’s hands-on mentality, which puts its youth in operational roles. “My first time there during my rookie year, when I saw the secretary was a 12-year-old and the head chef was a 14-year-old, I was drawn to that style of leadership and wanted to help out,” Nnamdi says. It’s not surprising Asomugha would be drawn to a charitable activity that stresses education — his older sister, Chisara, earned a B.A. from Stanford, a medical degree from Duke and is working on a pediatric fellowship at Yale; Chijioke graduated from Stanford with two degrees and is currently enrolled at Columbia Business School; and his younger sister, Udodirin, graduated from the University of California-San Diego and is working toward a masters in public health at the University of Michigan. Their mother and father both earned doctorates. As the family likes to joke, Nnamdi is the least-educated, with “only” a degree in corporate finance from Cal. 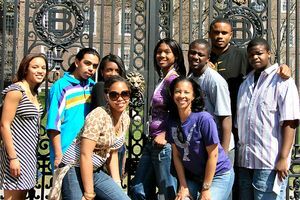 Thanks to Asomugha, kids were able to take a tour of colleges on the East Coast, including Brown University in Rhode Island. Two years ago, Asomugha suggested taking several of the teens on a college tour to Atlanta. He financed the trip for four students, some of whom had never flown on an airplane or visited a college campus. He repeated the odyssey last year, expanding the group to six and traveling to Boston. “Nnamdi opened my eyes,” says Adarious Payton, 16. “If he wasn’t here, I never would’ve gone to Boston, never would’ve been to the East Coast.” Asomugha made individual time for each student, like the night he stayed up with Yehoshua Jackson until 1 a.m., listening to Jackson — who is the Center’s 18-year-old head music teacher and hopes to attend Boston’s Berklee College of Music — playing his favorite melodies. Of the teens Asomugha has taken thus far, all say they want to attend college. 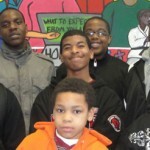 Because of the Center’s Pathway to College scholarship program, and Nnamdi’s help, that goal can become a reality. While he may be quiet on the field, Asomugha shows his true colors at the Center. “I’m a class clown,” he says. “Once you get me in my element, it’s bananas.” He finds as much enjoyment as the kids, like last June, when he took several students on a two-day fly-fishing trip. Most had never heard of fly-fishing, much less tried it. “I still say it was the best experience of my life,” says Jamal Jackson, Regina’s 14-year-old son. That legacy that doesn’t stop in Oakland. 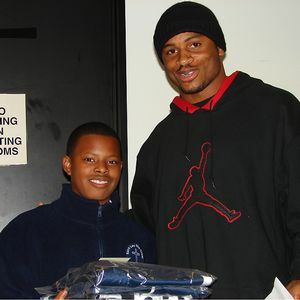 At his former high school, Asomugha distributes backpacks to the incoming freshmen each year. He also outfits the football and basketball team with shoes, a mandate he wrote into an endorsement contract he signed with Reebok. “Whatever else I can get my hands on in L.A. to help out, I do it,” Nnamdi says. Times are tough for the Raiders, but Asomugha remains a hero to many kids. Then there’s his family’s foundation work. Throughout Nnamdi’s childhood, the Asomughas took trips to visit relatives in eastern Nigeria. In a country that ranks among the top 20 in infant mortality rate, the family began providing food and medicine to widows and orphans victimized by poverty or abuse. In 2005, the family officially sanctioned the nonprofit OWIN (Orphans and Widows in Need) Foundation, with Lilian serving as the Director and CEO from her home in Los Angeles. Having added an educational component as well, the Foundation receives hundreds of thank-you letters from recipients each year. Occasionally, the letters are addressed to Nnamdi, the Foundation’s primary donor. “It’s a big deal [in Nigeria],” he says of OWIN. “You’d never know about it here, but most people in Nigeria know what we’ve been doing for years.” Currently, OWIN has two centers in Nigeria and hopes to expand to other parts of Africa. Dr. Agatha Chukwurah, who helps run the program in Nigeria, describes how the organization tries to visit a different village in Nigeria each month, offering women and children workshops on basic life skills. The villages often have no water, schools or medical help. They bring doctors and nurses to help train the women.